They say that the way to a lover’s heart is through their stomach–and here at XOXOAD, we are nothing if not servicey, so we asked Chef Ben Pollinger, Executive Chef at the beautiful Oceana restaurant here in midtown Manhattan, to talk to us about cooking a romantic meal. He was not only delightful, but you can tell from his answers that he really understands the XOXOAD reader! 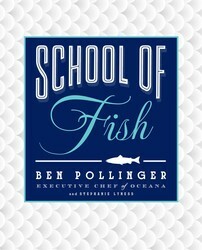 Chef Ben has a brand new cookbook out, School of Fish, that will help even a newbie cook make some amazing seafood dishes at home. We’re excited to be giving away a copy of this gorgeous book to one lucky reader–just answer the question at the bottom of this post in the comments. Now, on to our interview with Chef Ben! Many people are intimidated by seafood, either to eat or to cook; what do you recommend as a “starter fish” for the seafood-shy? Cod. Check out my one-pot baked Alaskan cod recipe. Cod is a great-tasting fish, flaky, moist and moderately flavored, a great fish to ease your way into seafood and build some trust. What led you to specialize in fish, rather than another culinary specialty? The cooking responsibilities in professional kitchens are often divided by what products are cooked; there might be a different cook for fish, meat, vegetables etc. I always had an affinity for the fish station and a good hand for it. To be a great fish cook you need to think about being in a close physical relationship. It’s a sensual experience–you need to understand what you’re working with, take care of it well and handle it gently but with confidence. We hear a lot about sustainability in the food world now; can you tell us some seafood to avoid, and some that we can consume guilt-free? I avoid Chilean sea bass, because while there is a small certified sustainable fishery, most of it is still fraught with problems including illegal pirate fishing. Wild Alaskan salmon such as king, sockeye or coho salmon are all wonderful, healthy and sustainable. And oysters actually improve the waters they are raised in. Plus, you know what they say about oysters: they’re guilt free but if you eat enough you might be feeling guilty the next day. What is the weirdest fishy delicacy you’ve ever eaten? What’s the most popular dish at Oceana, and is there an equivalent recipe in your cookbook? My General Tsao’s lobster, and yes it’s in the book. Everyone knows General Tsao’s chicken–it’s my favorite dish from the local Chinese restaurant. I wanted to get playful with it and do something you’d never think of, like dress it up with lobster. It’s crispy lobster with cashews in a spicy sweet-and-sour sauce served over black forbidden rice. And now for the romantic bits! We are XOXO, after all. What recipe in SCHOOL OF FISH would you recommend for a special romantic dinner? I’d keep the theme on the lighter side–you don’t want to feel too full or heavy for later. Start with some raw oysters of course, and maybe even a raw fish course after that, something like the scallop ceviche with apple and cucumber. Raw scallops lightly “cooked” in citrus juices have a very sensuous texture. Then go for snapper in a bag. If you’d like to be a little more romantic, use the French term, snapper en papillote. It’s very impressive but simple and easy, and you set it all up before your dinner. The snapper is baked in foil or parchment paper with some vegetables, herbs and wine, essentially steamed in its own juices. You bring it to the table, cut open the packet with scissors and all the steam and aromas come wafting out. Visually it’s kind of like lingerie–the initial outward appearance covers up and piques your curiosity about what’s underneath, then when you finally get in there, the fun really begins. After we make a wonderful romantic fish recipe from School of Fish, what are your insider tips on how to keep your hands or your apartment from smelling fishy? Great question. You’re never sure where your hands are going to end up. You can always wear gloves, and rubbing your hands with a cut lemon half certainly helps. For your apartment, try a recipe with a gentler cooking technique that will naturally keep the aroma down, such as poached, steamed or baked. You can also toast some sweet spices in a heavy dry pan, like some whole allspice, star anise, a cinnamon stick and cloves. Besides covering up any seafood smells, it also lends a nice warm aroma to the apartment. It actually can get you into the mood. What’s the most romantic thing that’s ever happened at your restaurant? We’ve had several wedding proposals. One was really funny because it was a couple dining at the chef’s table, which at Oceana is a glass-enclosed room in the kitchen. The gent had told us what he was up to, but once they sat down you could see him sweating and squirming with nerves until dessert when he popped the question. On the other hand, so to speak, on a few occasions we’ve suspected some frisky behavior going on underneath the tablecloths. And we’ve had a few patrons who’ve been politely requested to “get a room.” You’d be surprised how far some people will go at a table in public. What does a patron’s dinner order reveal about themselves? What you order for dinner can tell a lot about you, not so much one dish but the whole dinner put together: how health conscious you might be, how adventurous you are, how indulgent you like to be. Are you at a business dinner or with friends or on a date? It’s fun sometime thinking about people in the context of how they eat. Thanks very much to Chef Ben for his excellent interview! If you’ve been wanting to add more seafood to your diet, pick up a copy of School of Fish for tons of great recipes and advice. To enter the sweepstakes for a free copy of this amazing cookbook, leave us a comment answering this question: what’s your favorite seafood dish? There's plenty of fish in the sea, and Chef Ben can show you how to cook all of them! Wild-caught salmon makes a regular appearance on my dinner table at home. I always ask for lobster and crab legs with drawn butter for my birthday meal. When I dine out, I tend to choose seafood over any other offering. My favorite seafood dish is cioppino, though New England clam chowder is a close second (the best I’ve enjoyed was at John’s Grill in SF).